Get on your bikes, train and get ready to race... next Spring 2019. #1 - Saturday, June 2, 2018, 9AM. $9 registration for all SMS time trials. Swim, bike, run pace calculator. These cyclists have set the bar with individual course records for the new 22K course. New awards system. The overall top finishers race free next time trial. Course record setters get their $10 entry fee back as their prize and free entry into the next time trial. Note: Due to several timing errors at this TT, entry for the July 2013 TT will be free for all the participants of the May 2013 TT listed above.If any of your times are in error here please email me and I will correct. Also, starting at the July 2013 TT, all bikes will have an assigned, visible race number. 15 cyclists started and we all had a great time. Literally and figuratively. It was brought to my attention that several cyclists said the course was long? So I checked it after my workout at the Y. It is exactly... 9.5 miles. I must have made the start and finish farther back and the turn around slightly farther. This just means you're faster and got more for your money. Here's the results and thanks for everyone that participated this year! None... raced at least 2 2011 TTs. Correction!!! Cheryl Monroe is the 2011 Series Female Masters Champion. I awarded the title to Amanda Dryden and now I must take it from her. IM sorry I screwed up!!! To make it up to Amanda SMS is giving Amanda free entry into her 1st SMS TT of 2012. And... you may keep the award because you were the only time trialer other than Moi that did all 3 2011 TTs. IM giving Cheryl one too. SMS 2012 Time trail series dates will be announced by the end of the year. Also... SMS is adding a category. Super Masters! For the fit, 60+ year olds. 28 cyclists turned in times! It seems Wednesday afternoon is better for most of us so it will remain there. Thanks to the huge turnout from St Marys, Ga and our local, S Ga riders! And thank you to my timer and beautiful podium girl... Libby!!! 6 riders Time Trialed and the post race fellowship was even better. Thanks to all that brought food and drink including the very nice wine. The inaugural SMS 15K (9.3 mile) cycling individual Time Trial for August 21, 2010 held at Laura Walker State Park, Waycross, Ga... WAS a success and fun was had by all!!! We even had dogs and burgers and hydration afterwards and a lot of fellowship 'til dark! We give our thanks to all that attended and helped. You have helped Smith Multisports' 1st event become a success. Thanks to Wade, Laura Walker Park DNR officer, for providing law enforcement on the course during the event. Note: Allen (ME) is #1 cause I own the company. Janna is always #10 cause she is a "10". 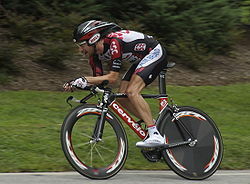 Future SMS plans include a Time Trial series for 2011. Spring, Summer (during the Tour de France) and Fall. The fall TT will be the season Championship. December Time Trial results... 12/11/10! 6 riders showed up to see who was the fastest over the SMS 15K time trial course today. Unfortunately no woman raced. Therefore it was decided that since there was only 1 rider under 40 (non Masters) SMS awarded the riders in order of finish... no categories. Here's the results. A person of note came but didn't race due to recovering from a recent cycling accident. Mary Beth Strickland supported those that raced! So she is the SMS TT Carpe Diem award recipient! Yay Mary Beth!